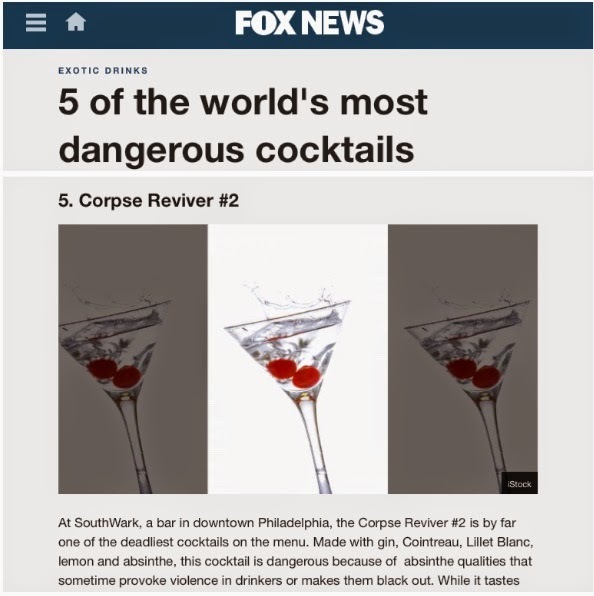 In the last week, those two great paragons of journalism (Fox News and the UK's Daily Mail) have listed the two cocktails featured in this blog article as being among the most dangerous cocktails in the world. The Corpse Reviver # 2 "is dangerous because of absinthe qualities that sometime provoke violence in drinkers or makes them black out." Death in the Afternoon: "A classic concoction of champagne and absinthe, this mind-blowing luxe cocktail was invented by Ernest Hemingway ... 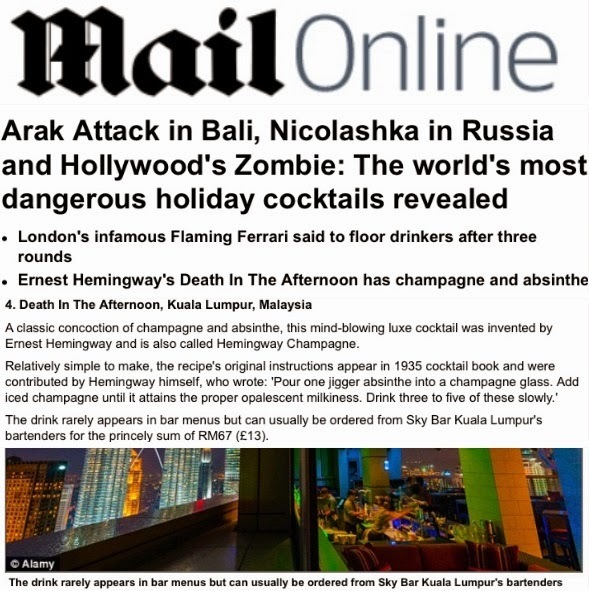 The drink rarely appears in bar menus but can usually be ordered from Sky Bar Kuala Lumpur's bartenders for the princely sum of RM67 (£13)." Both these articles demonstrate the journalists' complete ignorance of the drinks. 4 - 8 drops of absinthe in a Corpse Reviver # 2 is not going to provoke violence in drinkers. although the journalist's assertion (that it would) probably did provoke some drinkers to have ideas of violence towards ignorant journalists. As for the Death in the Afternoon, is it "mind-blowing" and does it "rarely appear in bar menus?" The second part clearly shows the journalist's ignorance, although full credit is due if he or she managed to get a trip to Malaysia funded by his/her newspaper to find it. 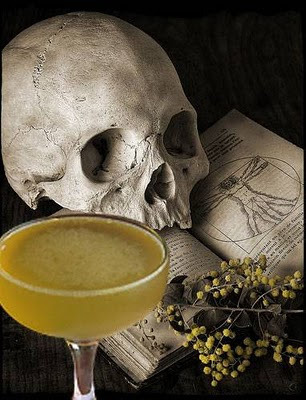 Halloween is a great time to re-visit another pair of absinthe cocktails: the Corpse Reviver No. 2 and Death in the Afternoon. The Corpse Reviver No. 2 (like the Corpse Reviver No. 1) is featured in the Savoy Cocktail book and was created by Harry Craddock at the Savoy's American Bar some time before 1930. No. 2 is a more serious proposition than no. 1: here are the ingredients as listed in the Savoy. "Four of these taken in quick succession will unrevive the corpse again." This version appears in the two Absinthe cocktail books published in 2010: A Taste for Absinthe and Absinthe Cocktails. One of only seven cocktails written up in both books, this is obviously an important absinthe cocktail (incidentally these books define the dash of absinthe as being four or eight drops). 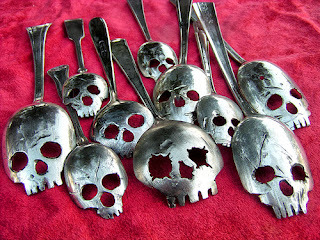 It's also a favourite of absinthe bloggers and of bars around the world. I made it using an old, no longer available gin (Gloag's from the makers of Famous Grouse), Combier Triple Sec, Noilly Prat and 8 drops of La Clandestine. And slightly less lemon juice than recommended. It's a very enjoyable and refreshing pick me up. So for Halloween brunch or lunch, what better way to start the day or to get it going than with this wonderful cocktail! I was also pleased to see Boston's Royal Sonesta making a ready bottled version! 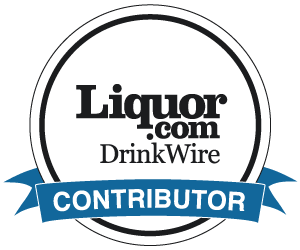 For more details of this, see the excellent IndulgeInspireImbibe blog. Here's a video from our friends at Common Man Cocktails showing how to make both Corpse Reviver Cocktails. Now onto the Death in the Afternoon cocktail ..
"Pour one jigger absinthe into a Champagne glass. Add iced Champagne until it attains the proper opalescent milkiness. Drink three to five of these slowly." I have always enjoyed Death in the Afternoon, but have also been aware that it might be a little dry for some people's tastes, especially if using a top quality champagne. So I was pleased to have the opportunity to try an interesting variation on this when my US partners visited us in Switzerland and suggested using a Swiss sparkling rosé to make a Death in the Afternoon. First the jigger of La Clandestine Absinthe, then top up with the sparkling rosé (I did top it up, but the members of the tasting panel sampled it before I could take my next photograph). ... and perfect to taste. Not too dry and not too sweet, with the absinthe and sparkling rosé working very well together. Of course a good cocktail needs a good name. I thought about calling this a Bloody Death in the Afternoon, but that might make people think it contains tomato juice. And for Halloween, I think a murder sounds better than death. It's definitely not an afternoon drink either, hence the final name .. Murder in the Evening. If you like a Death in the Afternoon, I think you'll love this. At Halloween or at any time. Since not every absinthe lover has a collection of other spirits at home. I thought it might be interesting to see how those who prefer absinthe the classic way can get into the Halloween spirit. 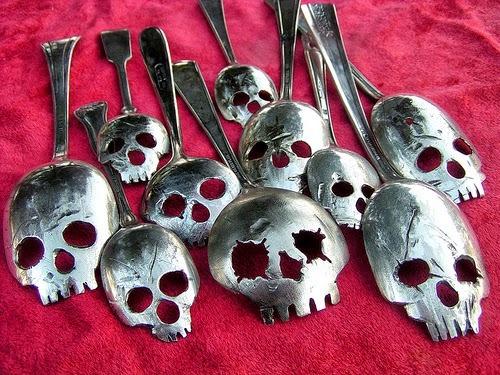 Available from Pinky Diablo for $45 (including free shipping in the USA), these wonderful skull spoons seem to do the job perfectly ..
Santé ... or since the drinks and spoons are for Halloween, we should be satisfied if we can just achieve ... survival!